Typically the World Series is the highlight of the baseball season. This has been true down through the years except for one star-crossed year – 1918. When the focus of the nation went from what was happening on the home front to the trenches of Europe. As World War I droned on in Europe, the patriotic fervor of the U.S. rand deep and high. In early 1918 the War Department issued a Work or Fight Order. The order applied to every able-bodied man. Soon the population cast their eyes on the men who played baseball. While young men from all other walks of life signed up to help in the war effort baseball players came under scrutiny. There was no getting around it. Baseball players would have to serve too. Bowing to the pressure in the summer of 1918, major league baseball responded. “On Account of War,” began a statement issued by the leaders of baseball. The telegraph stated the 1918 baseball season would abruptly end on Sept 1 and the World Series would begin on Labor Day. Then as now the World Series has served as a fitting climax to a long season. With interest at low level, the series matched up the Boston Red Sox and the Chicago Cubs. The Red Sox were led by a young pitcher named Babe Ruth, while the Cubs were hindered by the loss of their ace pitcher Grover “Pete” Alexander, who had spent most of the season fighting in France. In addition to the endless war in Europe, there was an emerging outbreak of Spanish influenza. An abortive player strike delayed Game 5 and caused fans to heckle the players with calls of “Bolsheveki!” The chess-like play kept the crowd down and interest in the Series low. After the final out, there was not so much a celebration as a collective sigh of relief that the most trying season in memory was finally over. The Red Sox won. A stark contrast existed between players striking for more World Series shares and those fighting the Great War. While many players performing stateside duties were accused of receiving preferential treatment, others in Europe clearly were not. Grover Alexander—the game’s best pitcher of the day—served on the front lines of France and suffered from shell shock, loss of hearing and developed symptoms of epilepsy that later would drive him toward alcohol abuse. Two of the era’s greatest and best know players—Ty Cobb and Christy Mathewson were part of a gas defense drill gone horribly wrong. Cobb escaped unharmed, but Mathewson inhaled a great amount of poison gas. As a result his health gradually deteriorated and he died of tuberculosis seven years later at the age of 45. Five men with major league experience died in battle, and more than 100 men in the minor leagues died as well. 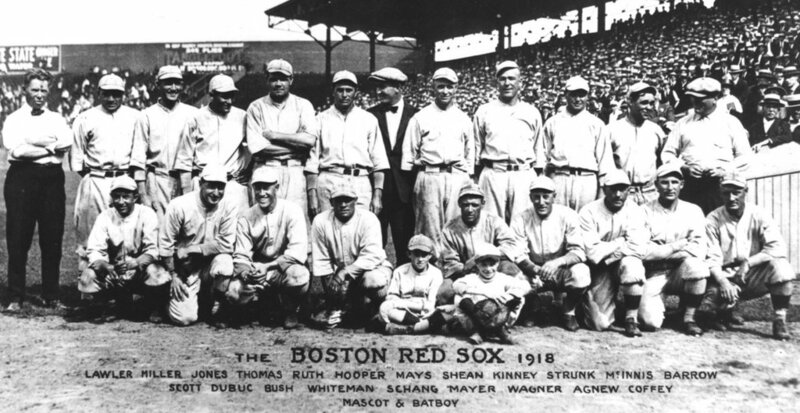 Rumor abounded that if war continued into 1919, the majors would cease operations completely. It became a moot point when Germany formally surrendered on November 11, 1918, ending the Great War. By the way, the library is honoring the 100th anniversary of the end of WWI, with a special exhibit in the gallery, and many special programs. This whole era of baseball is called the “Dead Ball era.” I think sports can often provide a window into the social fabric of society. Posted in Sports and tagged baseball, major league baseball, WWI.